With the average user receiving 15 emails with attachments per day, one would think that companies would have come up with ways to get rid of annoyances and issues caused by attachments. From bouncing emails because of attachment size limitations over sending multiple versions of the same file to storage issues. Most users know from first hand experience that email attachment have limitations. Microsoft has launched a campaign that aims to convince users that SkyDrive resolves all the core issues and limitations of email attachments. For that, an infographic and website were created. The infographic is backed up with data derived from two studies Microsoft conducted in the past two years. It lists all the issues and problems that the majority of users run into when sending attachments via email. Updated attachment may get sent back, causing versioning issues, especially if multiple recipients are involved. 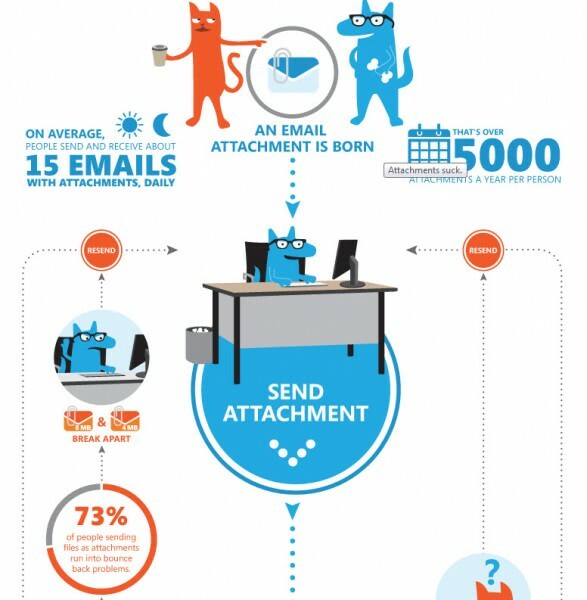 On average, people send and receive about 15 emails with attachments daily, which accumulates to over 5000 attachments a year per person. 73% of attachment senders run into bounce back problems. 53% of people delete 25% of their emails without opening them first which results in 5% of emails getting lost. 71% find that they need to update files after they have already sent them, with 25% running into this problem at least once a week. 44% of documents sent by email go through at least 3 versions before they are final. Some stats seem awfully high, like the number of attachments per day, or the 73% bounce backs. These issues are however not uncommon in work places, where you may receive that amount of attachments regularly. Even if the count is lower, the underlying issues remain and may need to be addressed. When I look at my accounts, I have to admit that I do not save email attachments locally, and that I sometimes receive multiple versions of the same file. The bounce back on the other hand was never a problem thanks to my tech background. Microsoft's solution? The company's cloud hosting service SkyDrive which not only offers larger file sharing but also document editing, collaboration and versioning as well. 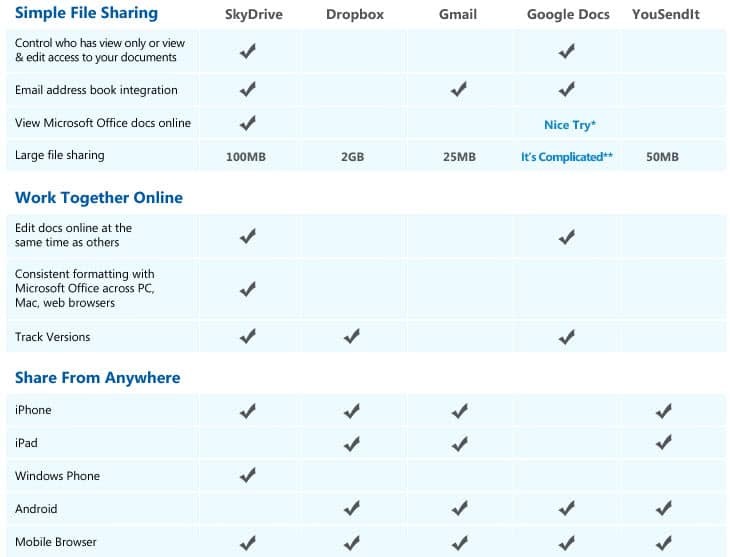 To further proof the point, Microsoft is pitting SkyDrive against competitive services like Dropbox, Gmail or Google Docs. The result? See for yourself. Is Microsoft SkyDrive the better way of sending files to other users? What's your take? Google Docs, It is not complicated to share documents/files. What’s really needed is a system whereby if you use Hotmail that ALL your attachments are automatically stored in SkyDrive and stripped out of the email, instead being replaced with a link to the file online. Whenever I have to reinstall Windows, restore it from a backup or install it on a new machine, it can take many hours for Outlook or Windows Live Mail to synchronise my several gigabytes of email and attachments. During this time, which can be up to six or seven hours, I can’t use my mail client software and have to resort to webmail, which is very inconvenient. servers there are issues with backups of HTTP mail. Outlook to folders on my computer and store them there. tool for that purpose or the PST file can be just copied. into the new Outlook installation restoring all mail. Though I prefer to send as attachment than SkyDrive but SkyDrive is a good alternative for larger file sharing. Hotmail have a good communication with SkyDrive. For that, using SkyDrive feels like it’s built into Hotmail itself. I’m surprised they didn’t include SugarSync in that comparative chart. They also claim to have an Outlook plugin (free by comparison to Box’s which is not). I really, really miss http://drop.io for this purpose. It was the easiest way to upload a file into the cloud, emailing only the link for download. Further, it didn’t require one to setup an account for use, and allowed the user to enter the name of the URL that was to be shared. Although http://ge.tt is a possible replacement, I haven’t found it as dependable. Various users have problems with uploads constantly restarting but never finishing. Hopefully this gets sorted out. Until then, has anyone found any other alternatives to drop.io? I have found SkyDrive to be a poor choice for file hosting, especially for business. SkyDrive does not seem to function well on Internet Explorer. Hee! hee! I like dat one! what’s up with the “nice try”? In fact, college kids who have to write in MLA use GDocs which keeps the MLA format. Skydrive screws up the MLA format. If reading this post has perked your interest in dropbox, use this referral to join – http://db.tt/BhlCqXE and get 2GM+500MB extra. Usually 250mb but with a .edu email, it is 500mb.